Affinity is a relationship intelligence platform enabling teams to leverage their network and close deals. Using patent-pending technology, Affinity allows teams to manage relationships by auto-populating the pipeline and allowing introductions to decision makers. 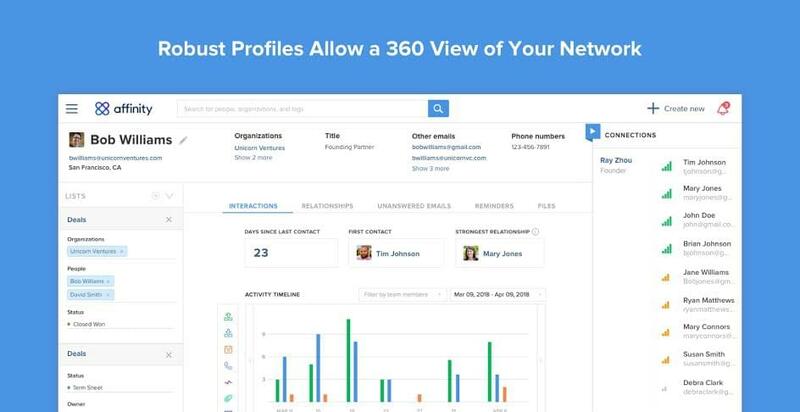 Affinity allows users to map out the team’s relationship graph and visualize the entire Rolodex of prospects investors and advisors are connected to so teams can discover valuable introductions. Affinity also allows teams to eliminate manual data entry and get rid of spreadsheets for contact management thanks to automatic contact updating. Teams can effectively manage the pipeline by enabling users to keep track of meetings, manage follow-ups, and receive instant updates related to the pipeline as the team works. Users can also automatically capture all relationship knowledge and enable team members to instantaneously find the right contacts at appropriate organizations. Users can build a consistent brand by equipping team members to align and not cross wires with the full context of all external relationships. Learn everything you need to know about Affinity. Our experts will reach out to you shortly.